It is the goal of the Handicap Committee that all handicaps accurately reflect the playing abilities of our members. To meet this goal, we need the help of all members. If there are any questions about handicaps, posting, etc., please contact the Handicap Director through this website. The USGA has done studies on the odds of a golfer shooting a score better than their handicap and has published tables for these occurrences. Callippe Golf Club will track exceptional scores shot in Callippe Golf Club tournaments. These include home and away tournaments sponsored by the Callippe Club as well as summer long match play scores. An exceptional score is defined as any score where the odds of shooting this score are equal to or greater than 24:1. Calculations are rounded to the nearest whole number. Best efforts will be used to review Callippe tournament scores after each tournament, and prior to the next club tournament. If a member has two or more exceptional tournament scores within the prior rolling six month period, a “local index” will be calculated for that member. This local index will be the average differential of the two lowest exceptional scores multiplied by 0.96. Differentials are calculated using the USGA formula (Gross Score – Course Tee Rating * 113 / Slope). If this computed local index is at least 1.0 lower than the member’s published NCGA index, this Local Index will be used to determine that member’s handicap for all Callippe Golf Club tournaments, including summer long match play. This is done so that handicaps used in Callippe Golf Club tournaments “appropriately reflect a member’s potential ability” (USGA wording). The member no longer has two or more exceptional tournament scores in the six-month period immediately prior to the current handicap period. The member’s NCGA index drops to less than 1.0 greater than the local index. Please Note: The Handicap Committee reserves the right to adjust a member’s handicap index, above and beyond the Local Handicap Index Policy outlined above. This will occur only when deemed necessary to preserve the integrity and fairness of club tournaments. Club Tournaments, Summer long match play, and 12 Man Team Tournaments: Do NOT post your score for these tournament rounds, we will post for you. Non-Tournament Rounds: Every time 7 or more holes of golf are played a score must be posted. 7 – 12 holes played you must post a score for the appropriate 9 holes (front or back). Record PAR plus handicap allowance for un-played holes if less than 9 holes completed. 13 – 18 holes played you must post a score for 18 holes. Record PAR plus handicap allowance for un-played holes if less than 18 holes completed. Equitable Stroke Control (ESC): ESC is a procedure used by the USGA in the calculation of handicaps. ESC sets the maximum number that a player can post on any hole, depending on the player’s course handicap (not their index). That table is shown below. One caveat: you should be very careful to check your course handicap before applying ESC. A 19.8 index may be a 19 handicap at one course (maximum score allowed per hole of 7) and a 21 handicap at another course (maximum score allowed per hole of 8). 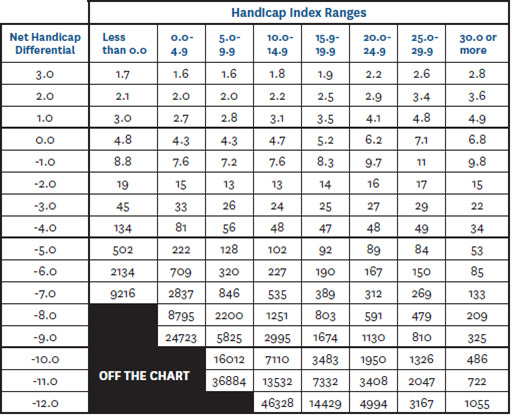 Most golf courses should have the Slope table that shows index ranges and corresponding handicaps, so be sure to check. For example: you are a 16 handicap, playing with your regular group, and on the 15th at Callippe, you dump a couple of approaches in the water, then compound the error with a three-putt, end up with a smooth 10 on the hole, and including the 10, shoot an 87. For any bets you might have with your friends, you must put the 10 on the scorecard. However, when you post the round on the computer, you have to adjust your score down, because the most strokes you can take for posting purposes as a 16 handicap is 7 on any one hole. Therefore, you should post an 84, reducing the 10 to a 7, and the 87 to an 84. Posting Errors: The following is a list of the most common mistakes in posting scores. Please take a look at the list, remember these items, and carefully review your scorecard before posting your score. Tournament “T” Scores: The NCGA has asked clubs to refrain from posting regular monthly events as tournament “T” scores. Their reasoning is that too many tournament scores dilute their value. The NCGA has asked that we only post “significant” events as tournament scores. The following is a list of Tournaments of “significance” from our schedule we will post as a tournament score.